Tel Aviv, Shabazi Street: Neve Tzedek’s latest Gallery is taking the Tel Aviv Art World by storm, and with good reason. 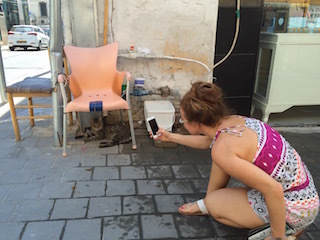 The Krakonowsky Gallery on Shabazi Street has cleared all of its walls in order to exhibit nothing but photos of people taking photos of cats in Neve Tzedek. The Gallery’s Chief Docent Yair G. explained. The Krakonowsky Collection’s Exhibit will continue through September, at which point it will switch over to pictures of tourists trying to find their way out of Neve Tzedek. Yair went on to explain that he has resorted to lying about his service in an effort to make it seem less glamorous. “I mean, I serve in Golani, but I told ‘Alyssa from Miami’ that I was assigned to the personnel office making copies. Still didn’t change anything.” As another tour group attendee, known only as “Jess from L.A.” approached Yair, he quickly broke away, saying only “That’s it, I’m telling “Breaking the Silence”. As the article went to print, approximately 47 members of Yair’s battalion volunteered to take his place, with 10 of them volunteering to extend their military commitment if necessary.